The CSB Outreach Bible is designed to be accessible and affordable for churches, ministries, and individuals to provide seekers and new believers a Bible of their own. Included are extra tools and resources to answer common questions and help readers to better understand and apply the truths found in God’s Word. 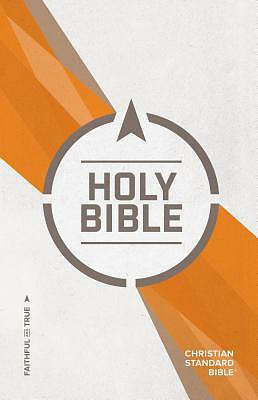 Features include: Two-column text, 7.75-point type, Topical subheadings, “Where to Turn” section with Scripture references for common life issues, “Frequently Asked Questions” with answers, Table of weights and measures, “Titles of Jesus” with Scripture references, and a Topical Micro Concordance. The CSB Outreach Bible features the highly readable, highly reliable text of the Christian Standard Bible (CSB). The CSB stays as literal as possible to the Bible's original meaning without sacrificing clarity, making it easier to engage with Scripture's life-transforming message and to share it with others. CSB Outreach Bible (Case of 24) by CSB Bibles by Holman, was published by Holman Bible Publishers in June 2018 and is our 4990th best seller. The ISBN for CSB Outreach Bible (Case of 24) is 9781535917179. Be the first to review CSB Outreach Bible (Case of 24)! Got a question? No problem! Just click here to ask us about CSB Outreach Bible (Case of 24).